There are so much to see in South Africa from the beautiful Cape Town to the picturesque drive along the Garden Route and of course the safaris. I will share with you what I feel are the highlights of a trip to South Africa. What’s more, Casino Midas is having a Africa promotion now where you can win a all-expenses paid trip to Africa just by making deposits. The prize includes Flights (International to Johannesburg and domestic to Hoedspruit), Accommodation and Meals (2 nights at Kapama Southern Camp and 3 Nights at Thornbush Waterside Lodge in Hoedspruit, Kruger national Park, South Africa) with all Transfers to and from destination and the services of local Guides and game drives. Cape Town is without a doubt the most popular destination in South Africa and its most popular landmark is the large plateau – Table Mountain. 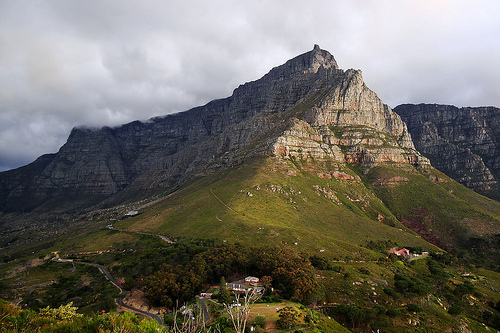 With the Table Mountain’s steep cliffs surrounding it, it looks like a table when viewed from far. The Table Mountain’s most beautiful moments are when it is covered in clouds, making it appear as if there is a table cloth over the mountain! Besides Table Mountain, there are beautiful beaches around Cape Town and an interesting fact about these beaches is that those on the Atlantic Coast have much cooler water than those on the Indian Ocean Coast (up to a 10 degree temperature difference!). Other interesting sights around Cape Town include the Castle of Good Hope, City Hall, Houses of Parliament, Tuinhuis – Dutch East India Company Gardens and the Cape Fur Seal colony on Duiker Island. 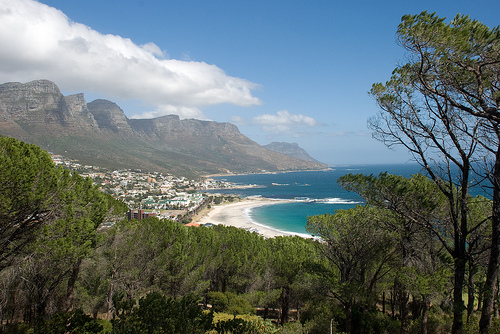 From Cape Town, you can take a picturesque drive along 250km of the north east coast of the Western Cape Province – also known as the Garden Route of South Africa with lush green forests and sandy beaches. Besides the Diaz museum and complex in Mossel Bay, you can take a 60km drive via the Outeniqua Pass to Oudtshoorn in the Klein Karoo where you can visit Cango Caves and various ostrich farms. The Garden Route finishes at Storms River in the Tsitsikamma National Park. If you prefer not to do a self-drive tour of the Garden Route, you can explore the area with Africa’s last remaining passenger steam train (Outeniqua Choo Tjoe) runs between Mossel Bay and George. If you are a wine lover, then you must go to the Winelands which are full of picturesque vineyards that produce some of the world’s best wines. The most famous of the six different wine regions is the Stellenbosch Wine region. You can visit the Winelands with the many winery tours departing from Cape Town. Safaris are what most people come to Africa to see – the most famous one in South Africa is the Kruger National Park which is home to the “Big 5″ over 140 mammals and 100+ reptiles. There are also other large game reserves in the country e.g. Madikwe Game Reserve situated on the Botswana border and the Shamwari Game Reserve located on the Garden Route. I love the way you have described the places expats should visit. I found it to be very useful in finding a place. Great article. I love these places. Thanks for posting this article.